Travelling takes a lot of planning and exploration. Tourists can justifiably be uncertain about new places and their required budget and that’s when a Travel Brochure provides useful information about the location they are planning to visit. A traveling services brochure is a short, concise description of the place where your firm is providing its services. This majorly includes holiday packages; hotels for stay, places to visit and other added value activities. It gives an insight to the traveler about where they are about to go and what services they will benefit from. 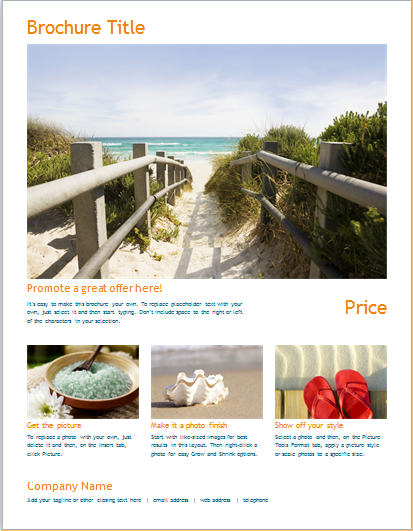 For your firm, a tour or travel brochure is a marketing tool through which you can inform and advertise your services. It can be handed when you are dealing with a prospective customer or can be posted and mailed online to a larger market. It is a small, paper-guide which has to be graphically strong. It must contain the images of the famous places and tourist attractions of the city or country you are promoting. The layout of the brochure should be distinctive with smartly chosen color pallet and powerful headlines. The details should be clear, reader-friendly and convincing. And for that reason, we bring you the high-quality travel brochure format. Since we deeply care about your time and money, this format has been specially designed to speed up your advertising procedure that will not only attract your customers but convince them of your reliability.